"Anti-fun is the negative experience your opponents feel when you do something that prevents them from 'playing their game' or doing activities they consider fun. While everything useful you can do as a player is likely to cause SOME anti-fun in your opponents, it only becomes a design issue when the 'anti-fun' created on your use of a mechanic is greater than your fun in using the mechanic. Dark Binding is VERY favorable on this measurement, because opponents get clutch dodges just like you get clutch hits, so it might actually create fun on both sides, instead of fun on one and weak anti-fun on another. On the other hand, a strong mana burn is NOT desirable -- if you drain someone to 0 you feel kinda good, and they feel TERRIBLE -- so the anti-fun is exceeded by the fun. This is important because the goal of the game is for players to have fun, so designers should seek abilities that result in a net increase of fun in the game. Basic design theory, yes?" I love this short and simple explanation of anti-fun, a principle that can locate and illuminate design decisions that may sound interesting but lead to a net loss of fun for one or more players. Some game features, while alluring, are actually anti-fun traps. Take melee kills in first-person shooters as an example. Gun wielding heroes might eliminate their targets with bullets the vast majority of the time, but when up close and personal, a punch, kick, or stab might be their best option. These days, it is quite rare for a shooter to not have a melee attack option. But how do we balance melee combat in game that emphasizes gun play? If physically striking your opponent is too weak, players will opt to shoot each other at point blank range, which may appear silly and require ninja-like maneuvering. Too strong and players will become easily frustrated. The reason my mind has wandered to this subject in the first place is Resident Evil: Operation Raccoon City. I genuinely find the game's melee combat shockingly inadequate. It embodies the concept of anti-fun almost perfectly. Raccoon City uses a stagger system that allows players to execute opponents if they time a melee strike correctly, hitting the button right when their enemy stumbles. Sounds good in concept. To make room for this, every melee hit knocks the opponent back slightly or even causes them to fall to the ground. At which point the defending opponent goes through an unbearably long standing animation, giving their attacker plenty of time to run up and melee even more. As expected, this causes chain attacks and painful "against the ropes" situations in which the player who hit the melee button a little too slowly sits there helpless, unable to do anything, just hoping their opponent accidentally misses and gives them an opening to run their melee chain. This is just one travesty among a slew of other problems. I can see precisely how a potentially good idea became garbage. In fact, I am somewhat surprised melee combat in shooters is ever managed successfully. To use a more recent example, Mass Effect 3's multiplayer and singleplayer features melee combat. Indeed, Bioware pushed the ombiblade attack heavily in its marketing campaign. A quick tap of the melee button will damage an opponent while holding the button down causes your character to charge up and unleash a devastating blow against your opponents. The attack is well balanced by a few key elements. First, enemies are rarely alone - fighting an opponent up close might leave you open to deadly enemy fire, discouraging anything but prudent use of melee. Uncharted 3 similarly discouraged melee combat, but unfortunately locked players into tedious and suicidal fight animations. Second, some opponents wear protective armor or shields, making them nigh invulnerable to melee attacks. Getting a melee kill against an Atlas, for example, takes a great deal of effort. Third, the instant-kill animation has limited range and takes a decent amount of time, giving enemies enough time to simply move out of the way, leaving you open to attack. All of this results in a fun, albeit occasionally frustrating melee combat. Call of Duty features far more lethal knife kills than the Mass Effect series, but manages to avoid anti-fun by implementing several key limitations. 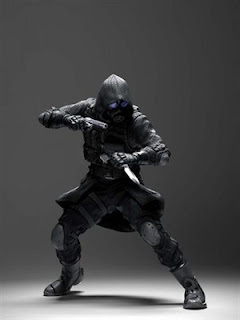 Although the combat knife generally kills opponents instantly, its range is incredibly short - roughly one to three feet. There is also a slight delay between the stab at the actual hit, giving players a brief moment to avoid the attack if quick on their feet. Additionally, the maneuver makes an audible noise, alerting surviving enemies to your location. The knife in Call of Duty 4 is incredibly lethal, yes, but bullets will easily take down an enemy who fails their "stealth roll." Can we really talk about melee combat in shooters without mentioning Gears of War? With the chainsaw gun, Epic elegantly mastered the art of melee combat in a shooter experience. The chainsaw attack is both aesthetically satisfying and implemented wonderfully. Like the other examples mentioned, there is a delay between starting the lancer motor and eviscerating an opponent. In fact, it is often smarter to start the lancer, maybe behind some cover, before running up to slice an enemy in half. Of course there is a cost-benefit dilemmas here too. Maneuvering the game's beefy characters while revving the lancer is difficult and slow. The chainsaw also emits a loud and recognizable noise that alerts opponents to your presence. To add a proverbial cherry on top, when enemies trigger their lancer at the same time, you both enter a high-tense button mash-off. Adding fun on top of an already well designed melee system? Thrilling! In Gears 3, Epic added the retro lancer, with its own minutely balanced risk and reward system, once again proving the studio has a firm grasp on what makes melee combat fun and interesting. Of course not all shooters can just copy and paste the Gears model into their own game. Indeed, I admire Slant Six's attempt to make melee combat in Raccoon City at least somewhat unique. Unfortunately they fell into the anti-fun trap, hard. I will always stop playing when turning off the tv is easier than playing ten more minutes of an anti-fun experience.